Sure, you know that the dentist helps you keep a full set of strong teeth and healthy gums. They give you a nice smile and better breath. But did you realize that the dentist could save your life, too? 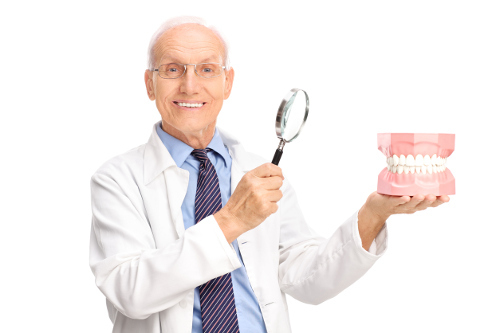 In fact, your dentist is an essential part of your defense against the dangers of oral cancer. The reason I’m telling you this is because April is Oral Cancer Awareness Month and, as with any other disease or illness, early detection is key to ensuring survival. Most Americans might not even realize they’ve developed oral cancer because the symptoms aren’t always obvious. And that’s where your dentist comes in. That’s why it’s beneficial to be aware of the statistics surrounding oral cancer as well as the various symptoms and treatment options available. Oral cancer affects approximately 50,000 Americans every year, and it is one of the top 10 deadliest forms of cancer. The fewer reported cases there are of this disease, the less likely people are to think they can get it. This leads to the larger problem of not enough people getting screened for this type of cancer. The first step in preventing oral cancer is to find out exactly what you need to look out for and what lifestyle changes you can make to diminish your chances of getting it. Of course, even if you’re now aware of the symptoms, it’s also crucial to have your dentist on your anti-cancer team. The next time you visit your dentist, even if it’s for a routine cleaning or check-up, ask for a full oral exam as well. That means you should have them examine your lips, the inside of your mouth, tongue, salivary glands, and throat. This way your dentist can catch any potential symptoms you might have missed or tell you if something you’ve noticed is a concern or not. So who’s at most risk for oral cancer? Middle-aged men who smoke, chew tobacco, and drink heavily are at the highest risk. Of course, having a family history of cancer certainly doesn’t help matters. Other risk factors include overexposure to the sun and contact with certain strains of the HPV virus. There are a few things you can do to lower your risk of developing oral cancer—and other forms of cancer for that matter. If you smoke or chew tobacco, quit (yes, even e-cigarettes can put you at serious risk). Wear lots of sunscreen before going outside, even on your lips—you can buy lip balms that contain low levels of SPF. Lastly, get an oral exam at least once a year—and book an extra one if you notice anything suspicious—and get tested for HPV on a regular basis. The good news is that, if caught early, oral cancer is very treatable and dangerous growths can be surgically removed. Post-surgery chemotherapy and radiation treatments are also available to eradicate any remaining cancerous cells in or on your mouth, face, or neck. Most importantly, never take your health for granted because it’s one of the most precious things you have, even if it’s “just” your oral health. The best thing you can do for yourself and your loved ones is to take good care of yourself and encourage them to do the same. “Oral, Head, and Neck Cancer Awareness Month,” Oral Cancer Foundation; http://oralcancerfoundation.org/events/oral-head-neck-cancer-awareness-month/, last accessed April 18, 2017. “Oral Cancer,” WebMD; http://www.webmd.com/oral-health/guide/oral-cancer#2, last accessed April 18, 2017. “April means Oral Cancer Awareness month,” KCEN TV, April 14, 2017; http://www.kcentv.com/news/local/april-means-oral-cancer-awareness-month/431502392, last accessed April 18, 2017.